Steering design for advanced logistics vehicles and mobile robots starts with understanding design requirements; deciding if custom is critical; and choosing the best solution for specific application. Logistics vehicles include stackers, forklifts, side loaders, pushers and tuggers, and even mobile robots. These move items from point to point, place and remove items onto and off shelves, fill pallets, load and unload trucks, and assist humans in other work. But such vehicles are only as effective as their steering assemblies. Logistics vehicles and mobile robots need to be rapidly and accurately steerable to specific location. Increasingly, that task is performed by electric power steering (EPS). This is a robotic forklift in a paper mill that uses a Fourdrinier Machine. Common steering architectures for logistics vehicles include differential-speed steering; steering with a single steered wheel coupled with two fixed casters; steering with two steered wheels capable 180° turning; and steering with two steered wheels capable of at least 360° rotation. It used to be that AGV and robotic-vehicle OEMs wanting to incorporate electric actuators had to build their own systems from scratch. Today these engineers can choose from myriad integrated steering builds — either off the shelf or customized to the application at hand. Steering systems must be accurate and reliable, even under high duty cycles. They must also be rugged, economical, and easy to install, operate, and maintain. Plus, they must satisfy specialized requirements imposed by electric steering. Common steering architectures for logistics vehicles include differential-speed steering; steering with a single steered wheel coupled with two fixed casters; steering with two steered wheels capable 180° turning; and steering with two steered wheels capable of at least 360° rotation. Motion path requirements: The simplest motion task for vehicle steering is to drive the vehicle along a straight line. Some installations mount vehicles on rails so no steering is required — just motive power from drive wheels. Slightly more complex are vehicles steered via fixed traction wheels run at different speeds. Such differential-speed operation imparts maneuverability, but this method can wear tires and stress the joints where the wheels attach to the chassis during very tight turns or rapid steering operations. Vehicles that must execute crabbing — motion perpendicular to the main travel axis — need at least two actively steered wheels capable of 180° rotation. Exotic wheels such as Mecanum or Omni wheels support such crabbing. Vehicles that must rotate in place (and revolve on an axis) need two to four actively steered wheels … each with a minimum of 360° rotation — or at least two wheels on the vehicle centerline to allow simultaneous rotation in the same direction. Turning radius: The required turn radius for a vehicle also impacts the steering design. A three-wheel counterbalance truck riding on a single-drive steering wheel and two casters has a fairly large turning radius. Vehicles with four steered wheels (each capable of 360° rotation) have smallest turning radii and the most flexibility for other movements without necessitating the exotic wheels mentioned above. Note that turning radius may limit vehicles’ maximum wheel or motor size. Small vehicles especially must have sufficient clearance to avoid wheel-chassis interference during operation. Steering torque requirement: Driving surface, load, and tire material all affect torque required to steer vehicle wheels. Vehicle velocity also affects this torque value. Pivoting wheels on a fully loaded forklift truck that’s stopped requires substantially more torque than pivoting them once the truck is moving. Steering motor and gearbox must be sized to deliver torque sufficient to satisfy the former. Steering sensor type: Forklifts, AGVs, and other mobile equipment may operate in very tight quarters. The control steering algorithm or human operator must have accurate knowledge of wheel angles … so wheel position sensing and feedback are necessary. Using relative wheel-position feedback is economical but requires a homing sequence at startup to establish a known steered wheel position. Absolute position sensing is a better alternative but has traditionally involved the use of proximity sensors or multiturn absolute positioning sensors — at added design expense. A third (and economical solution) is to employ traction actuators that use Hall-effect sensing in the gearing to establish absolute wheel position without the need for homing routines. This integrated traction-wheel assembly with steering includes a right-angle permanent-magnet gearmotor. The gearmotor turns a pinion that rotates the wheel about its centerline. The small white pinion and blue sensor (circled in red) send feedback on wheel position to a vehicle controller. Safety for collaborative logistics spaces: Especially in the case of vehicles moving in proximity to humans, safe operation is of utmost importance. So industry has evolved a comprehensive set of safety standards. Meeting these standards requires a combination of redundant systems, specialized hardware, and software. In the case of a steer-by-wire system, no mechanical steering linkage exists. The system must detect any problems, quickly bring the vehicle to a complete stop, and then apply a brake. Vehicle reliability: Operations designed around automated systems grind to a halt during vehicle downtime — even if production equipment is running just fine. It is essential that systems perform while simultaneously remaining economical enough to be viable solutions. Reliability is particularly important in the context of the recent industry shift toward service-oriented models. OEMs increasingly sell the service of moving goods, and thus uptime, rather than the vehicles themselves. In this case, reliability is not just a selling point but an essential aspect of the business. One EPS assembly includes an electric motor mechanically coupled to a swivel-mounted wheel. The EPS unit incorporates a pinion gear that turns a steering gear fixed to the wheel assembly. The EPS can then rotate the steered wheel as commanded by controls (or operator for manual control). Vehicle manufacturers increasingly prefer complete steering drive builds — especially those customizable to specific vehicles. 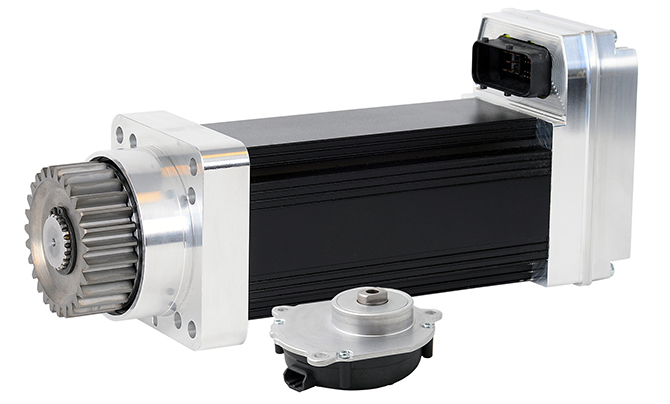 In one design, the brushless motor, gearing, servo drive, and feedback are all integrated into a single steering drive unit. In short, the main vehicle controller gathers input from integrated sensors in the EPS actuator and calculates path commands. Those it sends to the EPS drive electronics via fieldbus or wireless network (with CANopen most common at this time). Such operation is called steer-by-wire because no mechanical linkage exists between the operator’s steering wheel (or the vehicle controller, in the case of autonomous vehicles) and the steered wheel. Electric steering solutions generally include integrated or bolted-on gearboxes for mechanical advantage. The production ratio enables the steering assembly to generate sufficient torque using smaller, less expensive motors. Of course, steering actuators should be located as close as possible to the wheel (preferably integrated with the wheel assembly) to eliminate the need for additional mechanical couplings between steering unit and wheel. Also note that some vehicle designs may benefit from vertical orientation of the traction or steering motor. That’s especially true where the design has extra vertical space or where horizontal space is at a premium. In some cases, such vertical configurations also let engineers get a smaller turning radius for the vehicle. This is a vertically-oriented steered traction wheel assembly. The EPS steering actuator is right of the traction motor; the steering gear it drives is between the traction motor and wheel. As with traction solutions, steering solutions include discrete and integrated architectures. The optimal choice depends on the application. Discrete traction-drive steering builds are assemblies of individually selected motion components. Such designs are more customizable. However, they force OEMs to spend more time on system integration — which translates into higher overall cost. More time spent integrating a steering system also means less time the OEM design team spends on the design of the vehicle itself. Discrete steering builds are even more difficult to build when the wheels must provide both power and steering functionality. The entire wheel assembly (which may include two different motors) must also describe the smallest possible circular envelope during turns. Here, fully-integrated EPS units often deliver more compactness and flexibility than OEM-build designs. Integrated electric-steering systems available for purchase as complete assemblies greatly simplify design and installation. All components are engineered for optimal inter-operation. For example, the gearboxes are predesigned to satisfy design torque and power — even while minimizing backlash and wear. Because the component supplier purchases these subcomponents in volume, the final assembly is less expensive when procured in lower quantities by OEMs. Integrated steering builds also minimize wiring — to trim the costs and complexity of external wiring and interconnects. That’s in part because integrated designs integrate their electronics in their actuators. In fact, integrated EPS steering builds also include embedded software that can be tailored application requirements. This saves engineering hours for developing code and software validation — expensive and time-consuming aspect of safety in particular. Single-unit integrated designs can also come certified as units to save OEMs still more time and resources. The Allied Motion EPS steering motor actuator (right) is more compact and economical than a subsystem built from discrete components (left). Integrated motion designs also help OEMs trim engineering and assembly hours. But integrated systems are not universal solutions and can even compromise applications that need full customization. Maintaining spares of complete actuators may also be more expensive than having an inventory of discrete actuator components. On the other hand, downtime is usually quite costly for end users, so total actuator swapouts (to quickly return to full operation) may make for lower total cost of ownership (TCO) than that of discrete steering builds. Allied Motion’s EPS90 integrated steering motor actuator (here with a SWS steering wheel sensor accessory) includes a motor, gearing, feedback sensor, and power and control electronics. In conventional steering systems, drivers get tactile vehicle feedback through mechanical linkages to the wheels. But steer-by-wire systems have no such connection, so electric steer-by-wire power steering systems must simulate this tactile road response for the operator via slight variations in resistance to turning on the operator steering wheel. Common technologies to induce friction in steer-by-wire systems include mechanical brakes, electromagnetic brakes, and magnetic systems. Mechanical and electromagnetic brakes apply friction to provide the driver with a more realistic sense of how the vehicle is moving on the driving surface. But friction-based designs can be problematic where they transmit a misleading slip-stick sensation to the operator at startup. These plots of breakaway torque versus time show how friction-based resistance creates stick-slip at the start of motion — making it hard for drivers to make small steering adjustments (to drive down a narrow warehouse aisle, for example). Magnetic versions provide much more consistent tactile feedback. Mechanical brakes work too, but their friction contact mean they wear over time — necessitating continuous monitoring and regular maintenance. Performance depends on temperature, and that’s an issue on material-handling vehicles that may go back and forth between cold-storage rooms to outside many times a day. To be safe and effective, the simulated resistance needs to be consistent. Electromagnetic brakes are effective but expensive and bulky — and don’t always have sufficient response time to meet safety standards. In contrast, systems based on magnetic technology can provide very realistic steering-wheel feel (resistance) yet are economical. Magnetic systems don’t use friction so don’t exhibit stick-slip. Drivers get smooth motion that mimics the sensation of driving via mechanical linkage. When paired with magnetic position sensing, magnetic-resistance technology brings realistic performance to steer-by-wire designs. The feel of the steering is adjustable and even programmable in some cases … and noncontact operation eliminates wear and maintenance requirements. Allied Motion steering wheel sensors (SWSs) in steer-by-wire systems use magnetic resistance to simulate the feel of mechanical linkages. The post Electric actuators for better robotic-vehicle steering appeared first on The Robot Report.